Should employees be permitted to use Facebook or Twitter on the job? 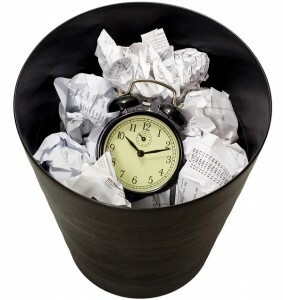 The typical reaction from owners & managers is some flavor of: “What a waste of time!” And while I’m the first one to agree that there are zillions of ways to waste time online, here are some factors worth considering. How productive are you and your team? This is typically cited as the top consideration for employers creating policies about Facebook and other social media activities. Compare this to Facebook and other forms of “workplace internet leisure browsing,” and you find that people who use the internet for personal reasons at work are about 9 percent more productive than those who do not. Counter intuitive? Perhaps… but when you consider that people often use leisure browsing and social media to help them effectively take a break and regain focus, it starts to make more sense. The workplace can be stressful enough without feeling boxed in by hard-line policies that are clear meant to serve the organization and not the individual within it. Yet 54 percent of companies ban workers from using social media sites at work. Using technology to block access to sites? What about mobile devices? Facebook and Twitter are being accessed from mobile devices and via text messaging more than ever before? Plan to “friend” or “follow” your employees? You could find yourself getting sued. Properly empowered and trained employees may be one of your company’s biggest assets in helping engage your prospects and customers. After all, do you have a person or department focused on brand management? We’ve pointed out in the past that social media is the new word of mouth. And since appropriate places to spend your marketing budget (you do have one of those, right?) are rapidly disappearing, it’s time to be effective with social media. Frustrated employees faced with stress and dropping morale can rapidly do more harm to your business with their social media posts (during work hours or otherwise) than you can imagine. And faster than you can imagine. My recommendation: build a clearly-articulated, concise strategy that authentically empowers your team to help spread the appropriate message(s) about your company while permitting them to use social media sites. There is no “one size fits all” for every business, of course. But my conclusion is that you will not actually be able to stop people from using social media at work, and efforts to do so will backfire sooner or later. Should everyone have carte blanche to abandon their work and surf the web? Of course not. But the most effective businesses are measuring (and rewarding) output rather than activity anyway. It takes some strategy, but your business can build a policy that creates a big win for all involved. It’s time to take action. 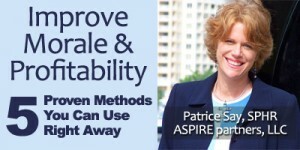 Incidentally, a colleague of mine is presenting a fantastic webinar tonight: “Improve Morale & Profitability: 5 Proven Methods You Can Use Right Away.” Patrice Say & her business partner, Joe Bettley, have a fantastic operation that improves business performance in a variety of ways. I highly recommend tonight’s event to you. Reserve your spot here — do it even if you’re not sure you can make it… it will be recorded. In the meantime… what kind of policies do you have about social media? How are they working? Leave a comment here to discuss! I think it is always a case of limiting usage rather than banning it. My last company were very strict about employees using Facebook at work and installed a big brother system allowing PC remote access by IT. That created a dreadful atmosphere in the office. Thankfully, I work for myself now and tend to ‘Tweet’ on and off all day!